Today begins a series on Acts – a slight leap from Jesus’ trial yesterday, but you all know what happened! I thought the beginnings of Christianity as we know it would be a good place to properly start this blog. In this section, a new disciple is being chosen to replace Judas. 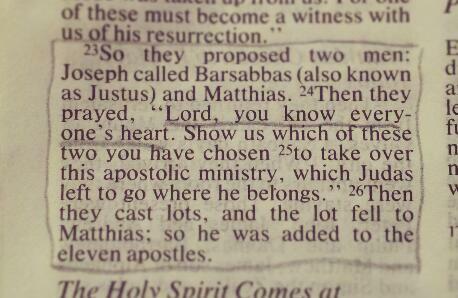 Can you imagine what it must have been like to be Justus? I’ve never thought of it before: the honour of having been one of the two chosen, followed by the crushing blow of being rejected – particularly as it was a ‘rejection’ by God. They asked God, who knows the heart, to reveal the best man for the job, and Justus had to watch God’s finger point away from him. How humiliating. I wonder what happened to Justus after that. How did he respond? Did he continue to follow faithfully, or did his sense of failure overwhelm him? Did God reject him because he knew he was mature enough to handle being overlooked? I love being in the ‘inner circle’, I love being trusted and being recognised by people in power/authority. How would I have reacted to being weighed and found wanting? How about you?